The Basilica Aemilia (Italian: Basilica Emilia) was a civil basilica in the Roman Forum, in Rome, Italy. Today only the plan and some rebuilt elements can be seen. The Basilica was 100 meters (328 ft) long and about 30 meters (98 ft) wide. Along the sides were two orders of 16 arches, and it was accessed through one of three entrances. 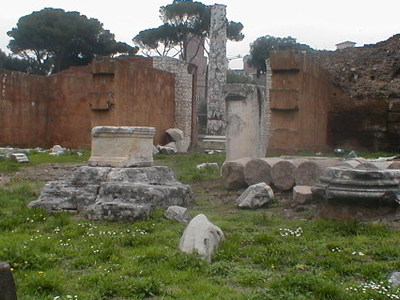 The new basilica was built on a site of the 5th-century BC tabernae lanienae ("butcher shops") and later (4th century BC) the tabernae argentariae. The latter housed the city's bankers, and after a fire were renamed tabernae novae ("new shops"). The square had two facing rows of shops. A first basilica had been built behind the tabernae argentariae between 210 BC and 195-191 BC, date in which it is mentioned by Plautus. Archaeological studies have shown that this building comprised three naves paved with tuff from Monteverde, the back façade having a portico which opened to the Forum Piscatorium and the Macellum (the area later occupied by the Forum of Nerva). Here's the our members favorite photos of "Ruins in Rome". Upload your photo of Basilica Aemilia!